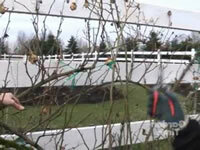 There are many growers that believe that you really don't need to prune climbing roses. The fact is that while the rose bush will continue to grow on its own if left alone, you are quite likely to discover that with each passing year you get less and less flowers as the bush just becomes unruly and difficult to manage. On the other hand if you adopt a yearly pruning routine and perform some basic maintenance on your roses, they will reward you with vigorous growth and abundant flowers. Typically most varieties of climbing roses will bloom at least twice in a growing season, and some will bloom continuously throughout. Usually the first blooms will appear on the older canes, and those are followed up by blooms on the new growth from the current season. If you prune your climbing roses while they are dormant, near the end of winter, but before the spring thaw, this usually encourages more blooms at the end of the growing season. The first step you can take before you start cutting off any branches is to get a full picture of what you have to work with. The best way to do this is to remove any leaves still left on the rose bush from the previous growing season. Don't worry, they don't need them any longer and will grow new ones in the spring. This is also a very good practice for helping reduce the spread of diseases as fungal spores will cling to leaves throughout the winter and can re-infect the rose bush the following year. Once you have the leaves cleared away it's very easy to see what you have to work with and how big the network of branches really is. The first ones to go will be any branches that are dead, diseased, or broken. Cut them back flush to the original cane from which they grew out of. If you have any woody canes that just didn't perform well the previous year, this is a good time to prune those and get rid of them. You also should prune any branches that are touching or crossing one another and do a very preliminary shaping of your rose bush. After you've finished the first step above, you probably removed a pretty good number of branches and the rose bush is looking much cleaner than before you began. Now is when you start being a little more selective in your pruning. Climbing roses will get pretty heavy when they are in full bloom so you are going to want strong and vigorous branches that will act as the framework for the plant. These will be pretty easy to identify because they will look healthy and strong and should have numerous buds swelling around the branch. You are going to want to keep these and start trimming back the thin spindly branches because they are not going to perform well anyway. This is also a good time to work on training your rose bush as well, before it starts growing and producing leaves. I usually start with the lowest branches first and train them outwards, working my way up the plant being very careful not to overlap branches or put them in a position where they would grow into one another, much like a fan shape when it is all said and done. 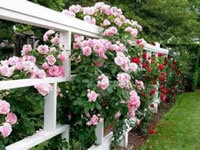 Most people grow their climbing roses against a flat surface such as a house or a fence. In these instances you are only working in two dimensions so the usual approach is to fan the branches outward into a nice fan shape that offers a lot of surface area for blooms. There are other shapes that one can choose to prune to, depending on the type of support you are working with. Another commonly used form of support are trellises. 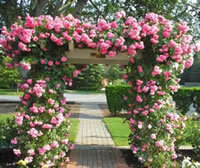 These are usually narrow and have limited space, so you have to use a little creativity when training your climbing roses in these cases. A really good way of pruning climbing roses to grow around a trellis is to shape two primary branches in a zig zag pattern that weaves its way up the support. Now everything you've read tells you that having branches touch is a bad thing. While the goal should be to keep them free of one another as much as possible, if they cross over at a couple points in order to produce the desired shape, that will be just fine. Just keep the lateral branches under control so they are not growing together. The last thing you should do while you are pruning any rose bush, not just climbers, is to remove any suckers that you might find growing out from below the bud union. Suckers get their name because they will grow as long spindly canes that grow a couple leaves and might even produce a flower here or there, but all they do is draw away nutrients from the plant when it could be using those nutrients elsewhere. Many people will simply cut off the suckers and while that gets rid of them temporarily, there is a better way. Grab the sucker at the base and snap it off of the plant by pulling it downward and way from the plant. Not only will this remove the sucker, but it will also remove the buds that the sucker grew from, preventing future growth. If you simply cut off a sucker, the bud will still remain and they are more likely to produce more suckers in place of the old one.